Now at the printer, issue VI-5 of Medieval Warfare is the very first edition of the magazine put together entirely by our new editor, Peter Konieczny. For his debut, Peter has chosen a theme that is sure to be popular: the sometimes mysterious and often misunderstood Knights Templar. Articles take a look at their origin, code of conduct, military tactics, equipment, and lasting legacy in popular culture. Additionally, issue VI-5 includes off-topic articles on Henry III and the Siege of Bedford Castle, plus the fascinating and (somewhat bizarre) world of Conrad Kyeser's Bellifortis. Theme: Peter Konieczny, "The rise and fall of a military order - Who were the Knights Templar?" Theme: Helen Nicholson, "None is more illustrious than it is - Why I write about the Templars"
The Military Orders were involved everywhere in medieval Europe, in everything that went on; therefore studying them is an excellent route into the society in which they lived. Two effigies of Templar Knights at Temple Church in London.Theme: Andrew Holt, "Bernard of Clairvaux and the Templars - The new knighthood"
Theme: Peter Konieczny, "From blood brothers to bad breath - Ten facts concerning the Templars"
The Knights Templar existed for almost two hundred years, and were active across Europe and the Middle East. They would become an international force, using their wealth to gain political power and support military activities in the Holy Land. But there are a few things about the military order that are not so widely known. Here are our favourite facts about the Templars. Theme: John Howe, "Military secrets of the Knights Templar - The Rule"
The Knights Templar are famed for failure — when they failed to preserve Christian control over the Holy Land, they were notoriously blamed, disbanded, and suppressed. Yet they had successfully protected pilgrims and provinces for more than a century and a half, despite being vastly outnumbered in an extraordinarily hostile environment. They had earned more and more responsibility for the defense of the Kingdom of Jerusalem, replacing local nobles as the keepers of border castles. From the second crusade on, they played a major role in orienting and guiding crusader armies. They must have been doing something right. Theme: William E. Welsh, "The Battle of La Forbie - Crusader catastrophe"
A great Crusader army left Acre on October 4, 1244, bound for the southern outpost of Ascalon. Accompanying them was a force of Syrian Muslims allied with them against the Egyptians and the mercenary Khwarazmians. The short-term objective of the Franco-Syrian army was to destroy the enemy encamped near Gaza. Afterwards, the Franks and Syrians planned to conquer Egypt and divide its territory between them. It was a lofty set of objectives, and the fate of the realm rested on the Crusaders’ success or failure. Theme: Danièle Cybulskie, "Fighting injustice to ruling the world - The afterlife of the Templars"
Heroes. Villains. Saviors. Destroyers. It’s hard to think of another organization that has such a widespread reputation of being both good and evil in almost equal measure. In a strange twist of fate, Philip the Fair’s defamation and destruction of the Templars in the fourteenth century has given them an afterlife in the popular imagination that has reached all corners of the world, far surpassing the reach of the medieval order. Given the relative brevity of their existence and the fact that they ultimately failed in their mission, what is it about the Templars that has kept us fascinated for centuries? 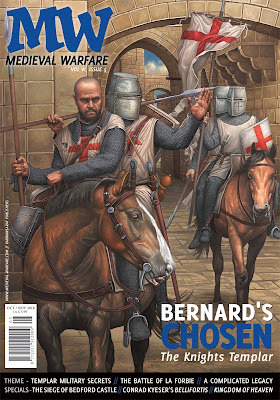 Theme: Cliff Repicky, "Forged in the furnace of Holy War - Bernard's chosen: The Knights Templar"
The origins of the Poor Fellow-Soldiers of Christ and of the Temple of Solomon began with nine French knights who volunteered to protect pilgrims making their way to various holy sites in the Outremer. They were provided with what the Christians believed to be the Temple of Solomon (hence Templars) as their base for operations. During their initial and informal years, they relied on the equipment they had brought or acquired, as well as the generosity of donors. Special: Owen Rees, "The siege of Bedford Castle in 1224"
For two long months, the small town of Bedford became the focal point of English domestic and international relations. The relatively minor revolt of Falkes de Breauté, and the subsequent siege of Bedford Castle, were being duly watched by dissident English nobles, a new French king looking to reclaim English-held lands in France, and a powerful Welsh king that was knocking on England’s borders; even Pope Honorius III had his mind on proceedings. What unfolded was a brutal siege that brought an abrupt end to a swift rebellion, and its thorough recording allows for modern historians to examine the logistics and the accounts that supported such a fundamental aspect of medieval warfare. Device for the forced lowering of a drawbridge, one of the many illustrations created by Conrad Kyeser in ms. Biblioteca Apostolica Vaticana, Vaticanus Palatinus lat. 1994, fol. 66v.Special: Brian R. Price, "Conrad Kyeser and his war-book - Bellifortis"
Conrad Kyeser has been called the Leonardo da Vinci of war machines. Indeed, his Bellifortis of 1405 was the first of a series of techne-focused war treatises that presaged Leonardo’s more famous work. It circulated widely for about 150 years but was then mostly forgotten. Fortunately, Bellifortis survives in at least fourteen manuscripts, and it stands as a testament to the rapid changes being wrought in the practice of war during the fifteenth century. Special: Peter Konieczny, "11th century military wit and wisdom - He is as useless as a pony in battle"
In the early eleventh century, a schoolteacher named Egbert of Liège created an instructional book for his students, for the purpose of teaching them how to read. His collection of proverbs, fables and folktales includes a few gems about warfare. Movie knights: Murray Dahm, "A modern film in medieval garb - Kingdom of Heaven"
Several films have dealt with the intriguing subject of the knights Templar. The one which looms largest, however (no, not The Da Vinci Code), is Ridley Scott’s 2005 The Kingdom of Heaven. The reason for this dominance is not just down to its budget and stunning visuals or its relative recentness, but also, unfortunately, to the sheer number of problems with the film. It has suffered from accusations of poor casting, poor history and modern agendas which have nothing to do with the history of the time. There is a great deal to examine so let’s get on with it.